How to match perfect BRACELET ? For some people choosing right bracelet is as simple as speaking or walking. They make it automatically and they make it good! If you are this kind of person, I'm sorry, this is not an article for you. 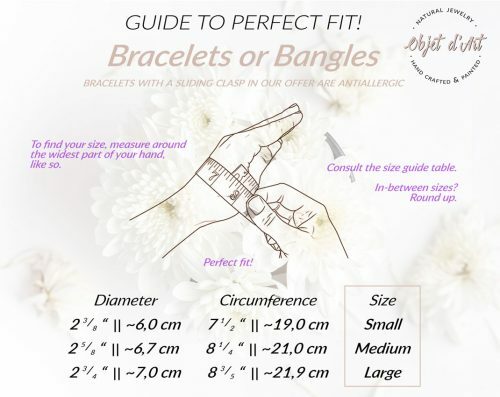 The article has been written for people who don't know too much about choosing bracelets or right sizes, also want to be more aware of this jewelry supply. Beautiful bracelet, handmade in our workshop. Made in the micro-macrame technique with plated crystals and semi-precious stones. Finished with a surgical steel elements (alloy 316). Custom order available in 4 sizes. I love bracelets because of the possibility of wearing them for any occasion and by anybody. 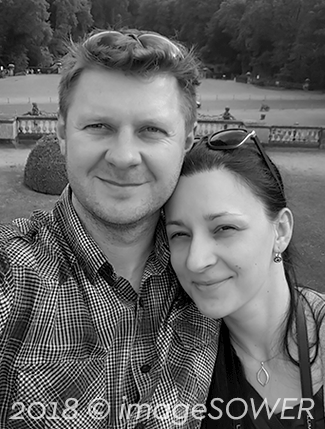 You can find perfect matches for women, men, children and older people, expensive and exclusive as well as economically rational. 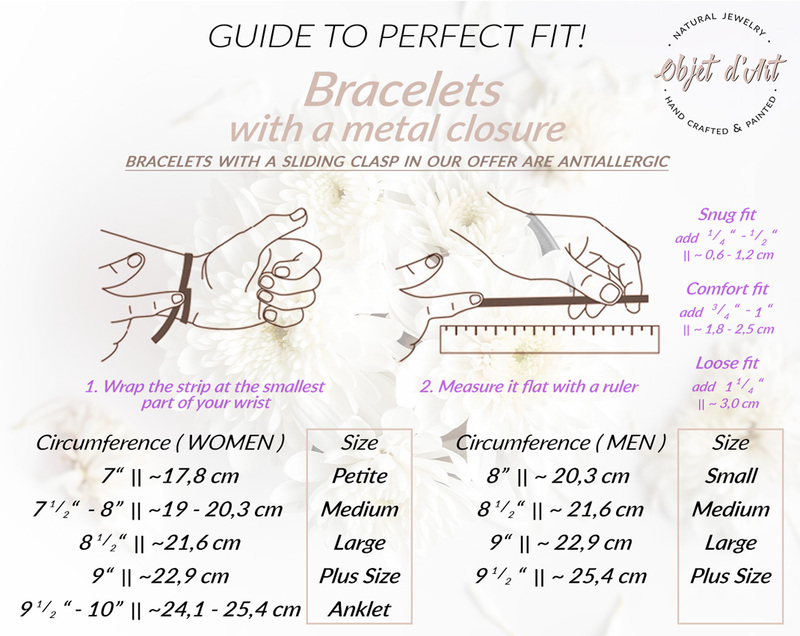 It's a very wide topic, however this article should help you in some basic orientation about sizes, materials and what matters during buying bracelet for yourself or as the present for somebody. It doesn't matter if you keep the order of this points. Knowing answers for all of them should help you to match perfect bracelet for yourself or for one of your beloveds. Below you will find descriptions of this 5 points as well as illustrated guides, made by us to help you. Each person has slightly different taste. It's a very long theme to analyze, however I try at least sketch the theme with some pairs of opposites to extend your perception a bit. Narrow or wide, modern or vintage, classic or folk, colorful or toned, beads or chain, metal or leather, classic materials or experimental, crafted or manufactured, produced local or global, men or women, old or young, child etc. It's more of them of course, how ever I think you have already enough 😉 If you would like to buy a bracelet for someone else then you, my advice is simple. Try to observe what kind of clothes prefers the chosen person, also talk with her / him, take a tour in local stores or just study some fashion magazines. This way you will get some sense of his / her style and taste. Often bracelets include some semi-precious stones or gemstones. 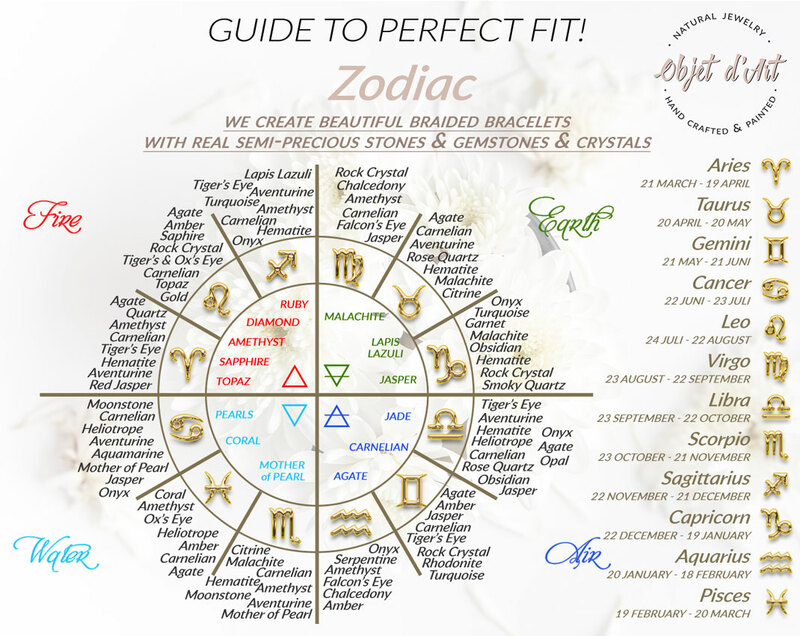 This guide will help you to match the bracelet with stones (or any other jewelry) to the person's birth sign or on of the 4 Elements. In simplification, we have only two types of bracelets. Bracelets with a closure or bangles. Any other types of bracelets are variations of these two types. So the proper size depends on the method of putting on the bracelet. 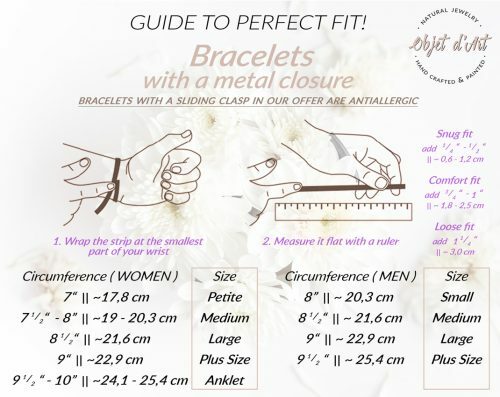 Below you will find two illustrated guides how to measure and what is your size of bracelet. This is an international table. The bracelet with closure can be finished with a metal or plastic ending, or with buttons, locks, fasteners, hooks or any other sort of them. The bracelet with a sliding clasp. Weaved from threads, cords or straps these closures are strong and practical. It's almost impossible for this kind of bracelet to accidentally fall off the wrist. Bracelets can be thin or wide, or somewhere between. Thin bracelet can be made from singular thread or chain. Sometimes they have additional bead, charm, metal-cut word or engraved badge. Wide bracelets can have solid construction or can be made from many layers of other thin elements, can include singular large elements or composition of these. Also can be made from many materials. Medium width bracelets are somewhere between these two. Wearing bracelets or any other type of jewelry can be very problematic for people with an allergy or sensitive skin. However the bracelet is the best choice of jewelry piece for them. You can always look for pieces without any metallic parts, which are usually cause of any troubles. On the market you will find many propositions with natural leather, jewelry threads and silicon elastics as well as natural stone, wooden, glass, plastic beads, which are safe. You should be aware, that some beads and bead spacers can be made from steel or acrylic covered by a layer of steel. They can be harmful. If you would like to have a metal parts in your jewelry, you should look for surgical steel elements. They should made from very modern alloy 316, which is designed for sensitive people. You can also look for nickel free metal parts, if you are sure this is a reason of the allergy. Under the brand OBJET d'ART we design also beautiful bracelets for sensitive people. We offer you to choose between closure's type. You can have a metallic lock or sliding clasp without bigger affection of the design. Our bracelets are hand weaved microMACRAME designs of crystals & gemstones or pearls. 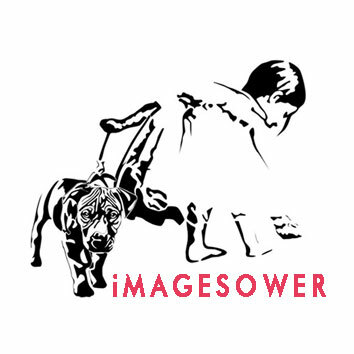 You can check in our shop by clicking on the image above. Final step. This is important especially if you would like to make a present for somebody. Nice box is always more exclusive then only holding bracelet in your hand. If you buy bracelet only for yourself the seller should give you at least a textile bag for it. This completely depends on you. Sometimes online stores are better idea, because they offer shipping to the indicated address. You should make sure that the seller offers a gift packaging option, nice idea is also an additional cart with wishes or sentence. If you order it as a gift make also sure, that the seller doesn't include check to the gift. During checkout you should note that you don't want this. If you are not sure about size or design, you should think about local store, where you can easy switch the chosen model with other or change or correct size. If you would like to have a beautiful bracelet, you should remember to store it properly. If you are going to store it in the box with other goods, you should at least remember about holding it in a separate textile bag (the on from seller will be perfect!). This way the metal parts and beads will be nice and shiny for longer time.